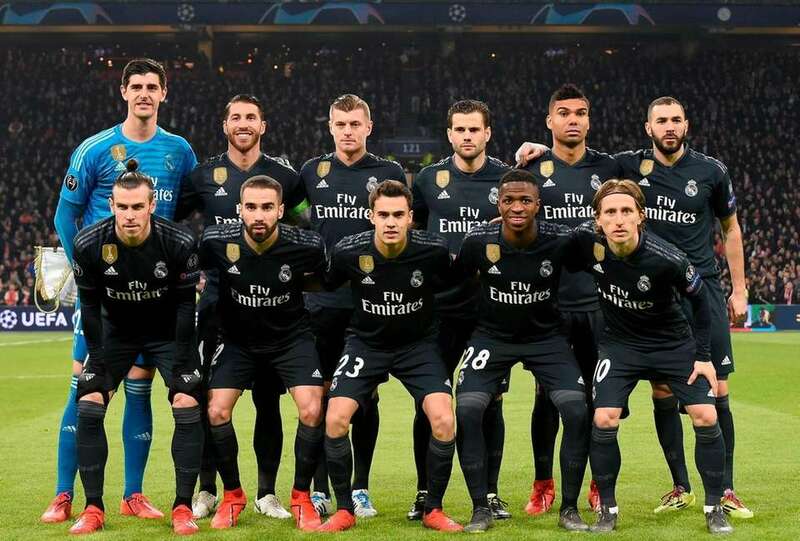 Real Madrid defeated Ajax, 2-1, in the first leg of their UEFA Champions League Round of 16 matchup on Wednesday at Johan Cruyff Arena in Amsterdam. Ajax and Real Madrid players observe a minute of silence for Emiliano Sala who died in a plane crash, during the first leg, round of sixteen, Champions League soccer match between Ajax and Real Madrid at the Johan Cruyff ArenA in Amsterdam, Netherlands, Wednesday Feb. 13, 2019. 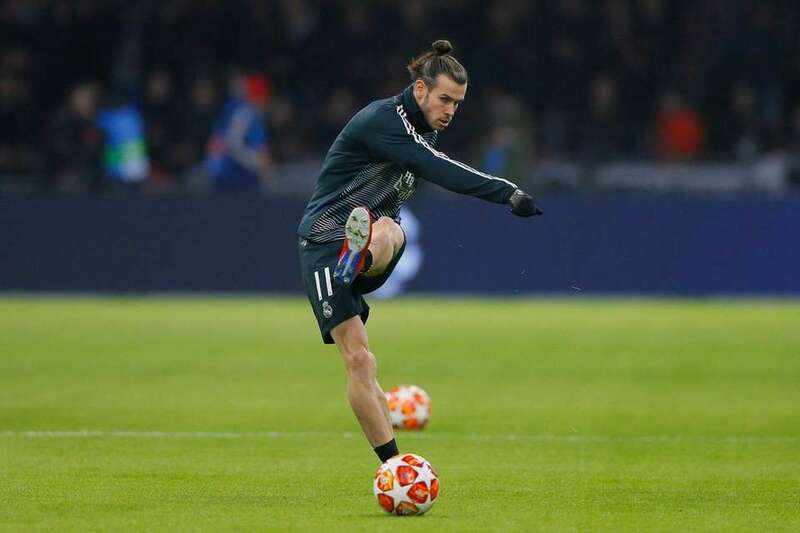 Real midfielder Gareth Bale shoots the ball as warming up during the first leg, round of sixteen, Champions League soccer match between Ajax and Real Madrid at the Johan Cruyff ArenA in Amsterdam, Netherlands, Wednesday Feb. 13, 2019. Ajax's Rasmus Kristensen, center, is tackled by Real midfielder Gareth Bale, right, during the first leg, round of sixteen, Champions League soccer match between Ajax and Real Madrid at the Johan Cruyff ArenA in Amsterdam, Netherlands, Wednesday Feb. 13, 2019. Real Madrid's players pose for a team picture prior to the UEFA Champions league round of 16 first leg football match between Ajax Amsterdam and Real Madrid at the Johan Cruijff ArenA on February 13, 2019: (back row from L to R) Real Madrid's Belgian goalkeeper Thibaut Courtois, Real Madrid's Spanish defender Sergio Ramos, Real Madrid's German midfielder Toni Kroos, Real Madrid's Spanish defender Nacho Fernandez, Real Madrid's Brazilian midfielder Casemiro, Real Madrid's French forward Karim Benzema, (front row from L to R) Real Madrid's Welsh forward Gareth Bale, Real Madrid's Spanish defender Dani Carvajal, Real Madrid's Spanish defender Sergio Reguilon, Real Madrid's Brazilian forward Vinicius Junior and Real Madrid's Croatian midfielder Luka Modric. Real forward Vinicius Junior runs with the ball as warming up during the first leg, round of sixteen, Champions League soccer match between Ajax and Real Madrid at the Johan Cruyff ArenA in Amsterdam, Netherlands, Wednesday Feb. 13, 2019. 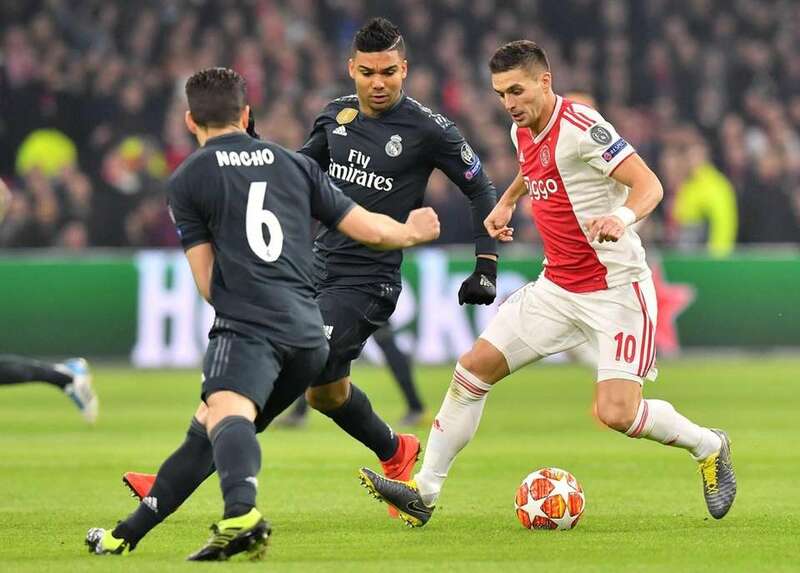 Ajax's Dusan Tadic, foreground, fights for the ball with Real defender Sergio Ramos during the first leg, round of sixteen, Champions League soccer match between Ajax and Real Madrid at the Johan Cruyff ArenA in Amsterdam, Netherlands, Wednesday Feb. 13, 2019. Ajax's Dusan Tadic, left, fights for the ball with Real defender Sergio Ramos during the first leg, round of sixteen, Champions League soccer match between Ajax and Real Madrid at the Johan Cruyff ArenA in Amsterdam, Netherlands, Wednesday Feb. 13, 2019. 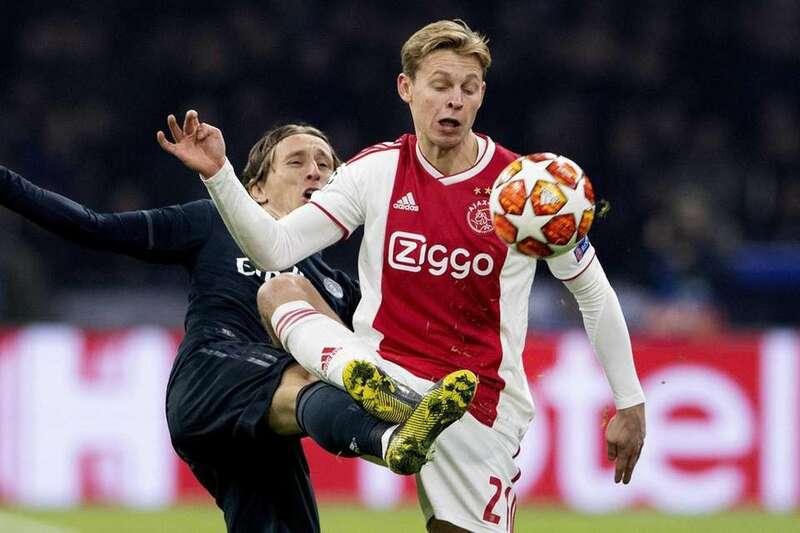 Frenkie de Jong (R) of Ajax Amsterdam in action with Real Madrids Luka Modric during the UEFA Champions League round of 16 first leg soccer match between Ajax Amsterdam and Real Madrid in Amsterdam, Netherlands, 13 February 2019. 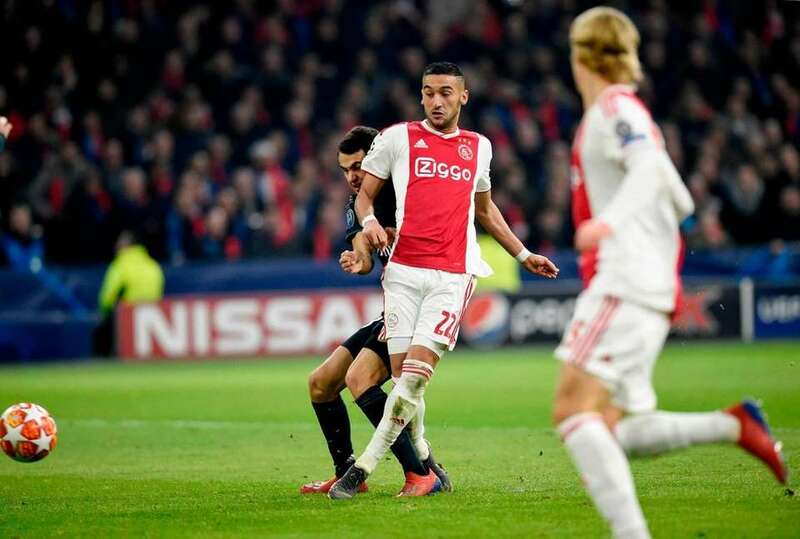 Hakim Ziyech (C) of Ajax Amsterdam in action with Real Madrids Sergio Ramos (L) and Toni Kroos (R) during the UEFA Champions League round of 16 first leg soccer match between Ajax Amsterdam and Real Madrid in AMsterdam, Netherlands, 13 February 2019. 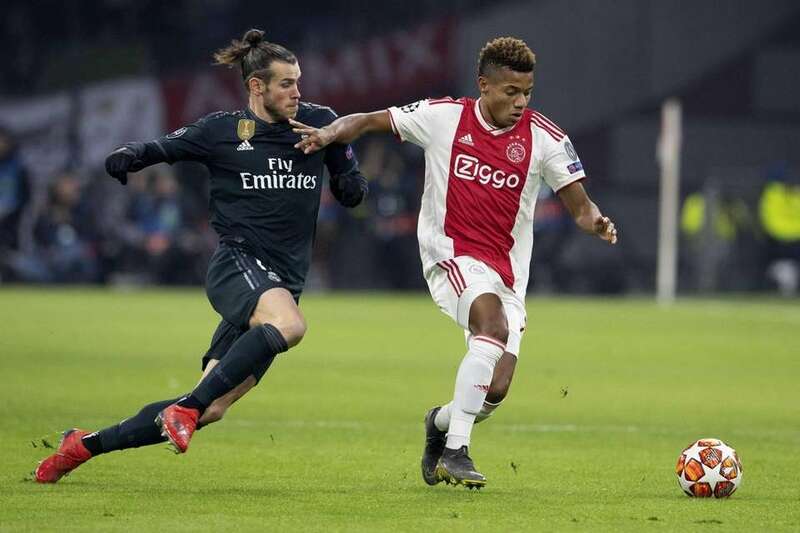 David Neres (R) of Ajax Amsterdam in action with Real Madrids Gareth Bale during the UEFA Champions League round of 16 first leg soccer match between Ajax Amsterdam and Real Madrid in AMsterdam, Netherlands, 13 February 2019. 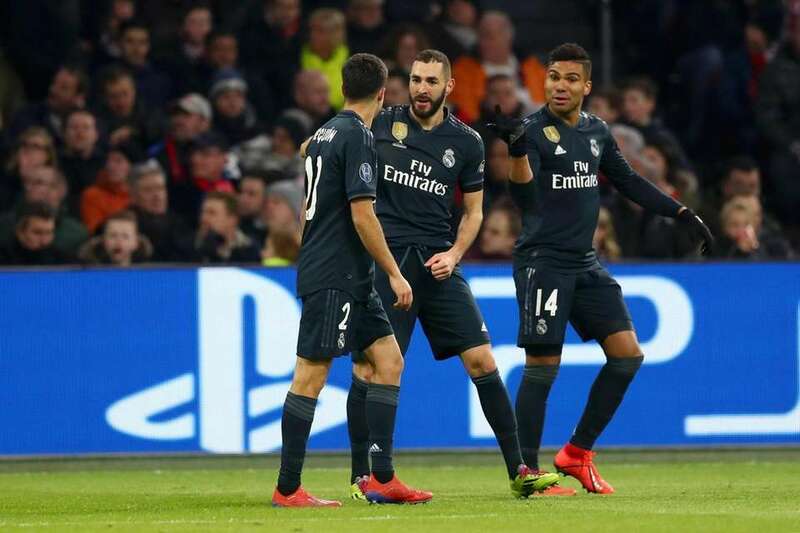 Karim Benzema of Real Madrid celebrates after scoring his team's first goal with Sergio Reguilon of Real Madrid and Casemiro of Real Madrid during the UEFA Champions League Round of 16 First Leg match between Ajax and Real Madrid at Johan Cruyff Arena on February 13, 2019 in Amsterdam, Netherlands. Ajax's Serbian forward Dusan Tadic (R) fights for the ball with Real Madrid's Spanish defender Nacho Fernandez (L) and Real Madrid's Brazilian midfielder Casemiro (C) during the UEFA Champions league round of 16 first leg football match between Ajax Amsterdam and Real Madrid at the Johan Cruijff ArenA on February 13, 2019. Real Madrid's French forward Karim Benzema (R) scores during the UEFA Champions league round of 16 first leg football match between Ajax Amsterdam and Real Madrid at the Johan Cruijff ArenA on February 13, 2019. 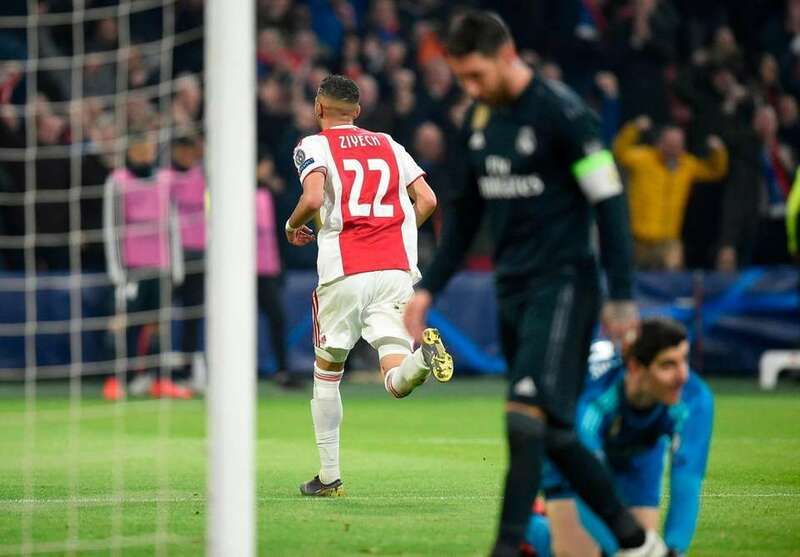 Ajax's Moroccan midfielder Hakim Ziyech (C) scores his team's first goal during the UEFA Champions league round of 16 first leg football match between Ajax Amsterdam and Real Madrid at the Johan Cruijff ArenA on February 13, 2019. 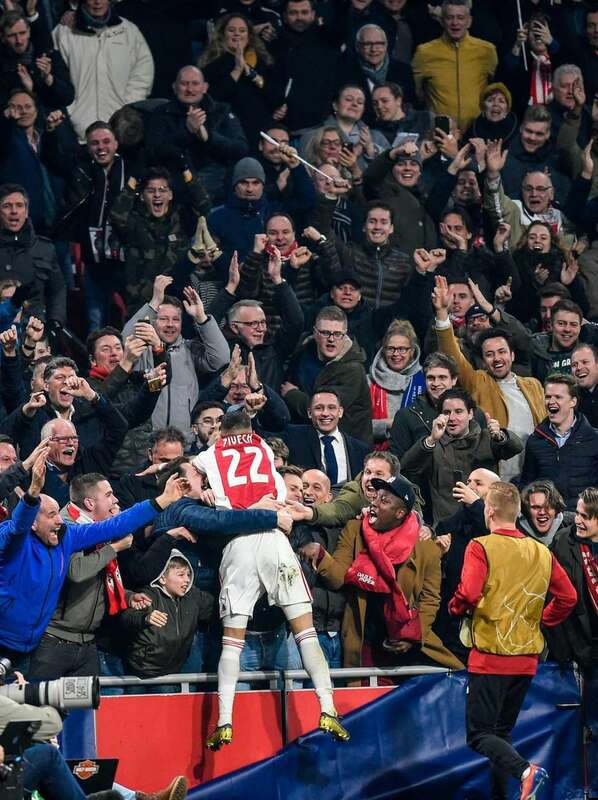 Ajax's Moroccan midfielder Hakim Ziyech (L) celebrates after scoring during the UEFA Champions league round of 16 first leg football match between Ajax Amsterdam and Real Madrid at the Johan Cruijff ArenA on February 13, 2019. 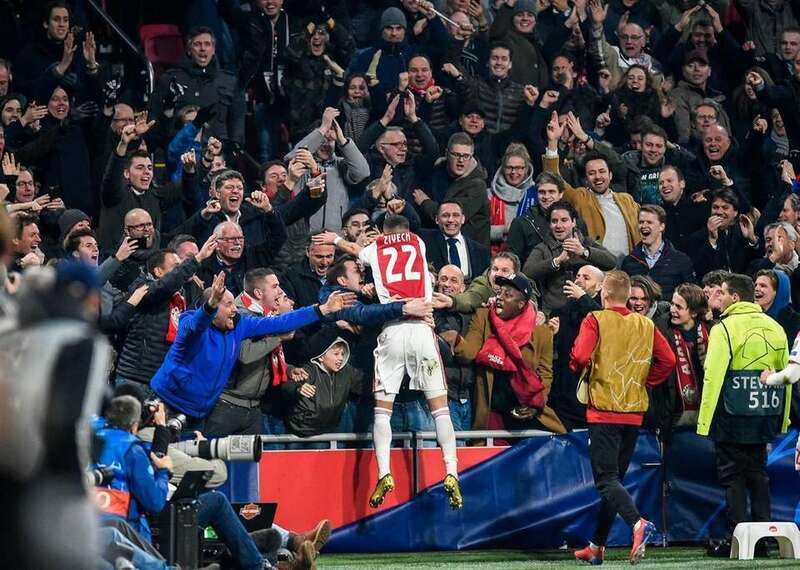 Ajax's Moroccan midfielder Hakim Ziyech (C) celebrates with supporters after scoring during the UEFA Champions league round of 16 first leg football match between Ajax Amsterdam and Real Madrid at the Johan Cruijff ArenA on February 13, 2019. 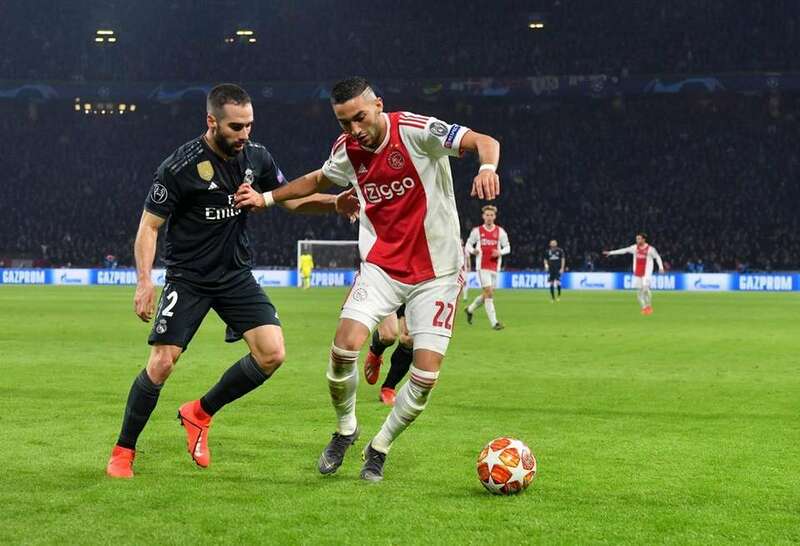 Real Madrid's Spanish defender Dani Carvajal (L) fights for the ball with Ajax's Moroccan midfielder Hakim Ziyech (R) during the UEFA Champions league round of 16 first leg football match between Ajax Amsterdam and Real Madrid at the Johan Cruijff ArenA on February 13, 2019. 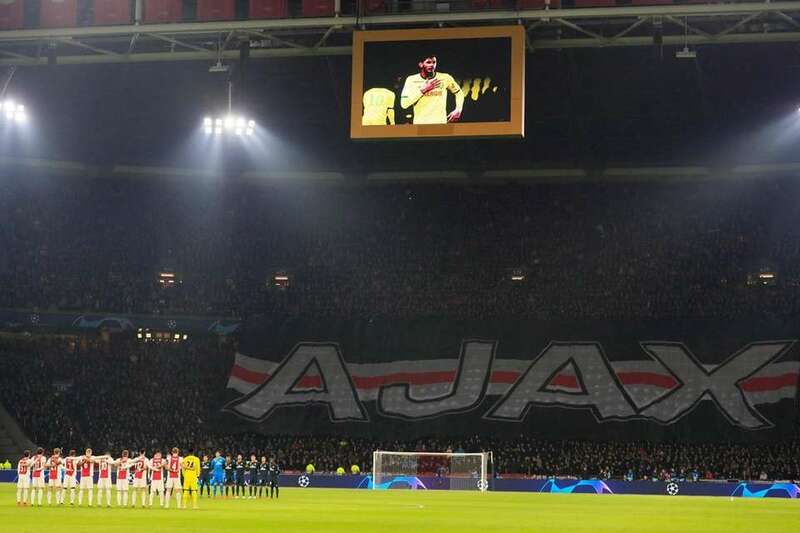 Ajax's Argentine defender Nicolas Tagliafico (3rd R) scores a goal which will be rejected after VAR deliberation during the UEFA Champions league round of 16 first leg football match between Ajax Amsterdam and Real Madrid at the Johan Cruijff ArenA on February 13, 2019. 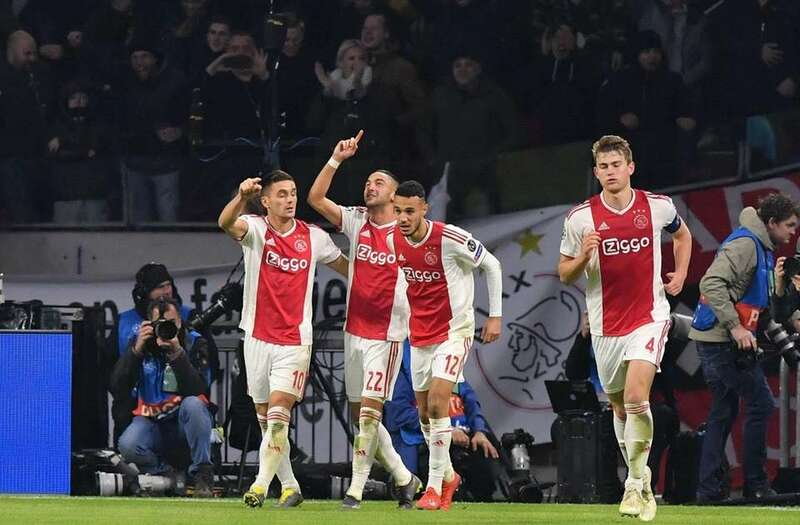 Ajax's Moroccan midfielder Hakim Ziyech (2nd L) celebrates with Ajax's Serbian forward Dusan Tadic (L), Ajax's Dutch defender Noussair Mazraoui (2nd R) and Ajax's Dutch defender Matthijs de Ligt (R) after scoring during the UEFA Champions league round of 16 first leg football match between Ajax Amsterdam and Real Madrid at the Johan Cruijff ArenA on February 13, 2019.